Location: Montcléra, in the Meurthe-et-Moselle departement of France (Lorraine Region). Notes: The castle of Montcléra is located on the town of Montcléra, in the department of Lot.It was the seat of a seigneury created at the beginning in 1334 by the Duke of Normandy, the future John II, offers the lands of Montclera for services rendered to Arnaud de Commarque by dismemberment of the royal jurisdiction of Cazals. Arnaud de Commarque served Pope John XXII and Clement VI. In 1346, by an agreement between King Philip VI and the Bishop of Cahors, the land of Montclera is considered as the limit of royal and episcopal jurisdictions. In 1368, the seigniory passed to Amalvin de Commarque in a tribute to the Bishop of Cahors, who is identified as Amalvin de Gironde1 in a new tribute in 1391. The seigneury suffered damage during the Hundred Years War. The seigniory was reoccupied by the Gironde only in 1446. In 1504 the castle which belongs to Jean de Gironde is cited for the first time in a count. François de Gironde made his will in 1610 for the benefit of his son, Brandelis and his grandson Francis under the condition that they carry the arms of the Gironde and Monclera. Brandelis de Gironde was married in 1605 to Louise de Gontaut-Biron. The lordship of Montclera and the viscount of Lavaur were raised in marquisate by King Louis XIII in 1616. 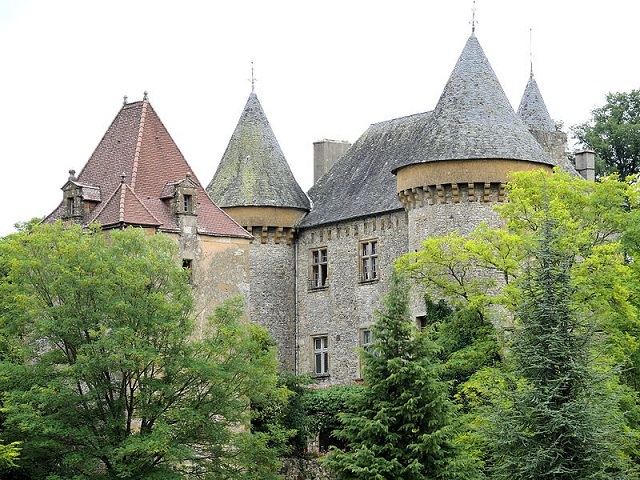 The castle remained in the family of Gironde until the nineteenth century and then passed to the Dupuy family. The castle has been registered for historic monuments since October 26, 1925 while the front door has been listed since January 21, 1929.The castle of Montclera is a building of the fifteenth century, remodeled in the Renaissance. It consists essentially of a rectangular main building flanked by round towers with machicoulis, one of which receives the corner of an imposing square dungeon with a square tower and whose large attic is perforated with windows of the second renaissance. The façade with corner chains is pierced by a doorway and a pedestrian door, both of which are semicircular. The whole is surrounded by a beautiful park.